Egrets develop a beautiful lace of fine plumes in the breeding season. Prior to their protection they were shot and the plumes used in the millinery trade. Various sub-species include the White Egret egretta alba, the Little Egret egretta garzetta, and the Cattle Egret ardeola ibis. 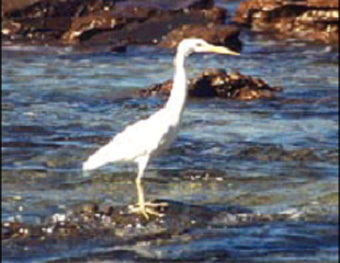 The Plumed Egret is, however, the most common. Their diet includes small fish, aquatic insects and fresh water crustaceans. This species builds flat twig nests in colonies at 50 to 70 feet from the ground. Their nests precariously balanced in forks are frail, so it is usual to find fallen eggs and young littering the ground under a colony. These birds are gregarious, and it is typical to find other Egrets or Herons nesting in the same or neighboring trees. The egg clutch is four and their colour a pale bluish green. The season is January to March, and in the Botanic Gardens the young leave the nests in April.